"The union between Larry and I started in 2000 when I went to work for him at his custom cabinet/millwork shop," stated Bill Lunstrum of Mountainsong Instruments. "Soon we found our shared love of woodworking and bluegrass music and it inspired us to build a pair of F-5 mandolins followed by two Martin M-style guitars – one in mahogany and one in rosewood. The next guitar was a Herringbone Dreadnought in Indian Rosewood." Mountainsong Instrument's latest offering is a special instrument – a Brazilian Rosewood Adirondack Spruce replica of a 1937 D-28 Martin. After the guitar demo, Keith Dill a multi-instrumentalist for 35 years and currently a member of the bluegrass group "Patent Pending" stated, "This is the best guitar I've ever played. It's a very special guitar"
"We are excited to bring our love and knowledge of woodworking, access to unique lumber and eye for detail to this new venture," stated Larry Cochran of Mountainsong Instruments. "We are looking forward to specializing in a very unique niche market and on top-quality custom-made instruments." Mountainsong Instruments specializes in unique and custom-made guitars and mandolins. Bill and Larry have a combined 75 years of experience in fine woodworking and instrument building. Their access to quality lumber and perspectives on handcrafted instruments give them a unique position in the marketplace. 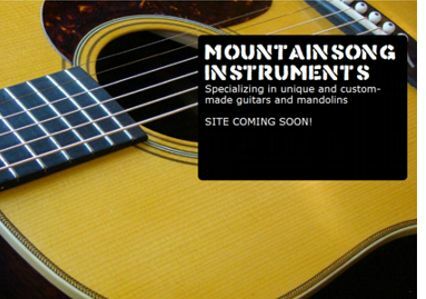 Their website at www.MountainsongInstruments.com is scheduled to launch in Summer 2012.